Whether you have a spacious eat-in kitchen or a small efficient kitchen, we’re sure you’ll agree that it’s the heart and soul of the home. A kitchen serves as a place for so much more than simply preparing meals. It’s a gathering place, a makeshift workplace and, of course, where we eat. So, it makes sense that we should utilize the space in the very best way possible to accommodate all the activities that take place there. One great way to combine space savings and a decorative accent is to utilize walls and ceilings. Walls are the perfect place to hang pretty trivets, everyday cooking utensils such as large metal spoons, whisks, spatulas and measuring spoons, and even pretty dishtowels. 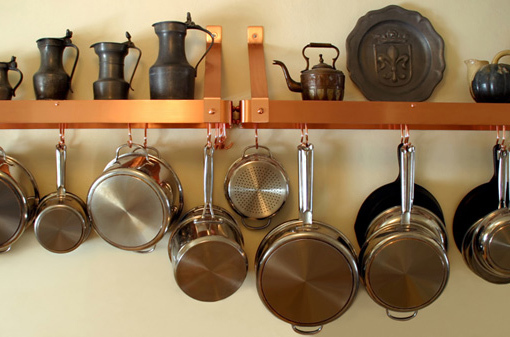 Use ceiling hooks to hang baskets to store colorful fruits and vegetables; or install a decorative overhead rod and hang all your best pots and pans for easy reach – you’ll free up cabinet space for other less frequently used items. Cluttered counter areas are our pet peeve. 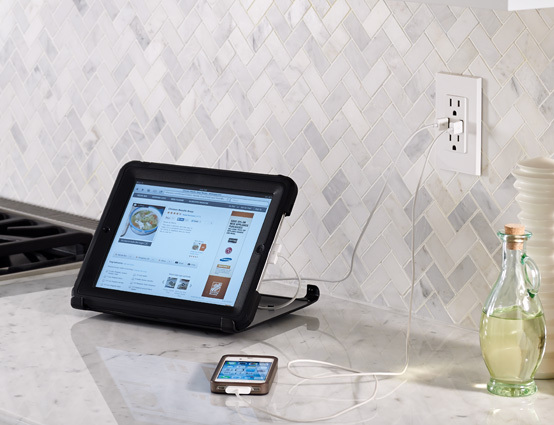 These days, more than ever, it’s a problem because everyone seems to want to charge their personal electronic devices in the kitchen – on the counter using one outlet! And, all those big, clunky adapters take over the outlet and there are cables everywhere and it’s just a mess. Well, we solved the problem with our line of USB Charger Devices. 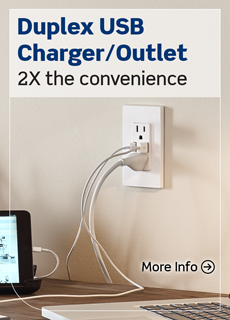 Whether you choose the 4-Port USB Charger or the USB Charger/Duplex Tamper-Resistant Outlet, you will immediately de-clutter your outlet/counter space by using the USB Ports to charge, leaving the outlets free to plug in the coffee maker! With all the activity in a kitchen it’s only logical that safety is a concern. We’re on top of that too. First and foremost, make sure any outlet near a water source is a GFCI outlet. They’re required by the National Electrical Code® to help prevent against shock or electrocution. Our GFCIs are easy to install and come in a variety of colors. Finally - lighting. With the kitchen being a high traffic area it makes sense to take steps to make lighting as efficient as possible. We have some great suggestions. Top of the list is a dimmer. 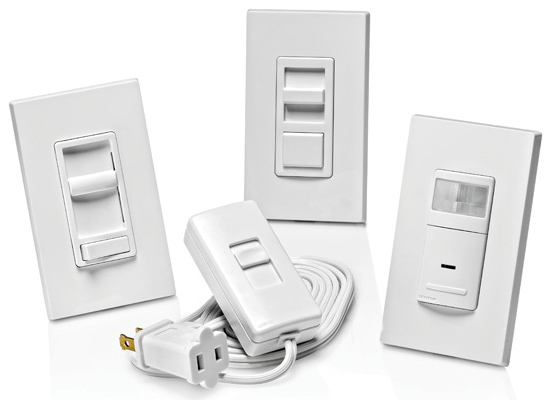 Leviton Universal Dimmers work with incandescent, CFL and LED bulbs so they are a sure match for your current fixture. Controlling light levels by use of a dimmer accomplishes two things: it ensures the lighting is appropriate for the task and it saves energy by allowing you to lower light levels when full brightness is not needed. You can also step it up a notch with our Dimming Sensor. Yes, a motion sensor that also functions as a dimmer. You get all the benefits of a dimmer plus lights that automatically switch ON when activity is detected and automatically switch OFF when activity stops. Great for when kids run in and out and for when entering the kitchen with hands full of grocery bags!